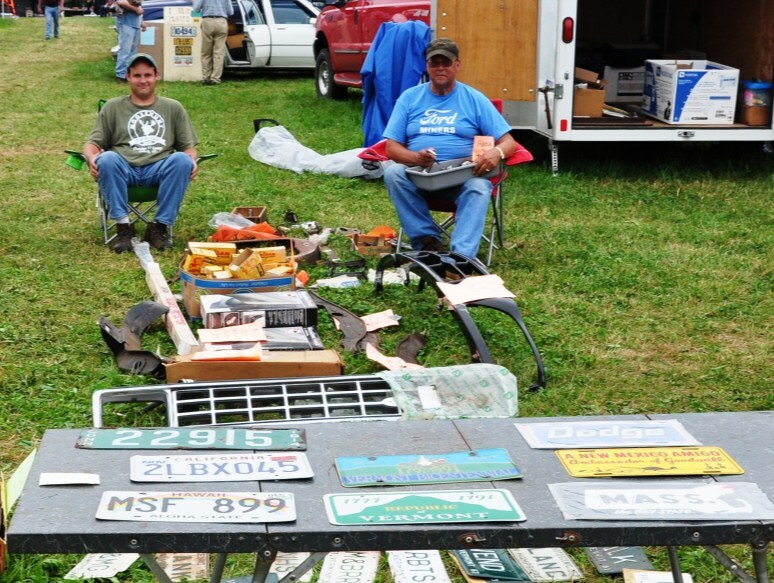 Stowe Show Vendors… here are four of the 250 who brought their wares to this year’s Show. What makes them so special? They have been coming to our show for nearly 40 years. 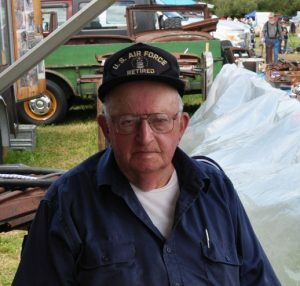 It was Chuck Haynes’ birthday on the 10th of August, the first day of the 2012 Stowe Car Show. 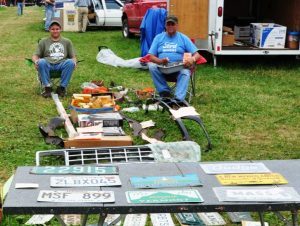 It was also his 37th time coming to the Stowe Show to sell his wares. Chuck, pictured on the right, has been a long time VAE member and was president in 1970. He has seen many changes in our club and has helped guide the VAE to the great club that we are today. Chuck’s son, Paul (on the left) has plans to carry on when his dad decides to slow down. Chuck specializes in Ford parts and has a 5000 sq. foot warehouse in Montpelier. 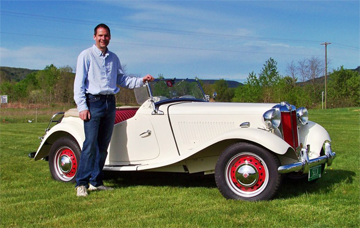 He sells mainly on Ebay where he renews his listings every Friday, his Ebay handle is vtcarnut. 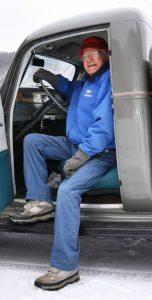 A car delivery in 1966 started him on his Ford journey. 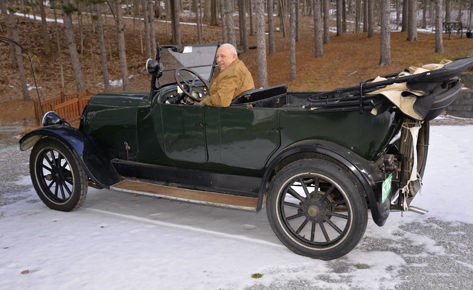 While working for a dealership in Haverhill, NH the owner sold a Model A to a customer in Chicago. The buyer wanted it ‘driven’ to Chicago to be sure the seller was telling the truth about the car and Chuck was chosen to make the 1000 mile drive. While driving through Detroit he decided to stop at the Ford plant with his Model A to see if he could get a fifty-cent tour. This led to a job offer and employment at Ford Motor Company. 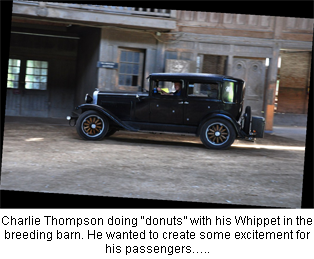 The big city and big business did not mix well with Chuck’s country background and he soon returned to New England where he was involved in many other adventures in his 68 years. Some of us might remember an auto parts store by the name of Daltons on Hoyt Street in St. Albans. The store opened in 1922 and closed in 2005….Chuck purchased the inventory and spent 14 months moving it all to his warehouse. Can you imagine visiting Chuck’s warehouse? Walt Rodiman (left) became a Stowe Show vendor in 1976. A retired Air Force gent and a dealership parts man is most likely what led Walt into his vendor journey. 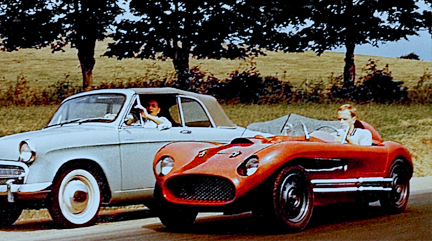 In years past, Walt has spent his summer traveling to as many as 16 car shows. 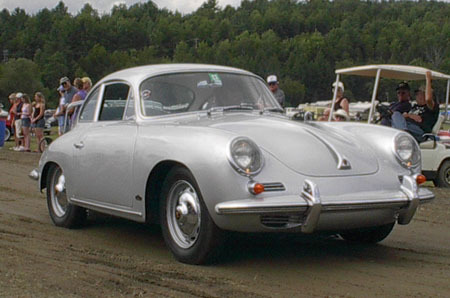 He claims the Stowe Car Show is one of the best. When asked why, he points to the people passing by and says “look at the big crowd and there are no fights…everyone is happy”. 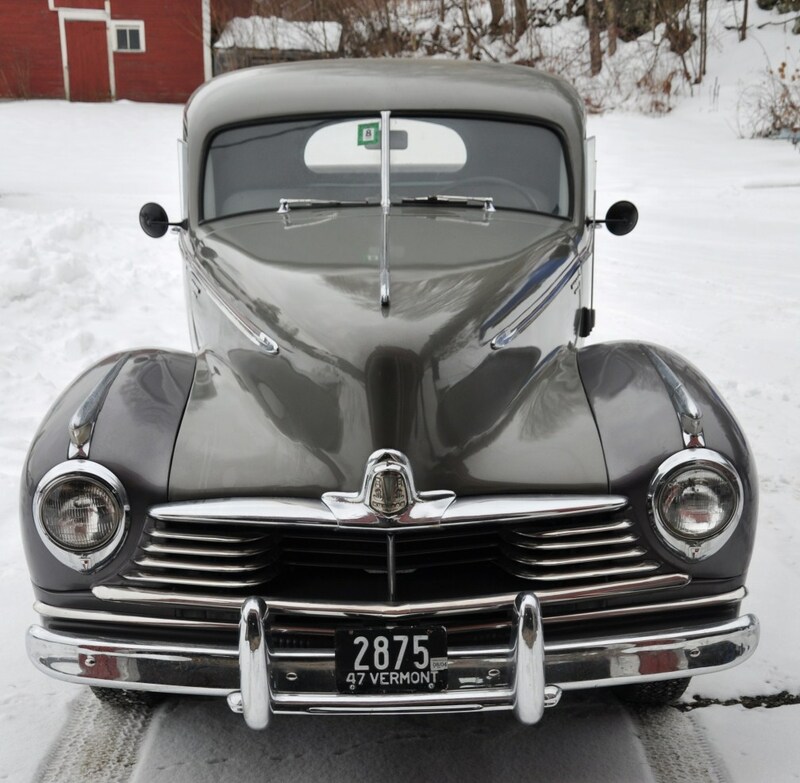 Walt has 6 spaces and makes three trips from Piermont, NH to fill them before the show…and full they are. It didn’t take long to discover that Walt ‘knows his parts and his cars’ as customers had all kinds of questions for him. It also didn’t take long to find that Walt is as honest as they come. Customers would have a part in their hands ready to purchase and Walt would be telling them they would be wasting their money by buying the item because it would not fit on their car. Walt has two sons, Michael and Wayne. We all hope his Stowe vendor tradition will continue another 36 years. When asked if he could do something better than the sober expression when his picture was taken he replied if we want him to smile we should wave a one hundred dollar bill in front of him. We all had a big laugh. Good luck to you Walter Rodiman. 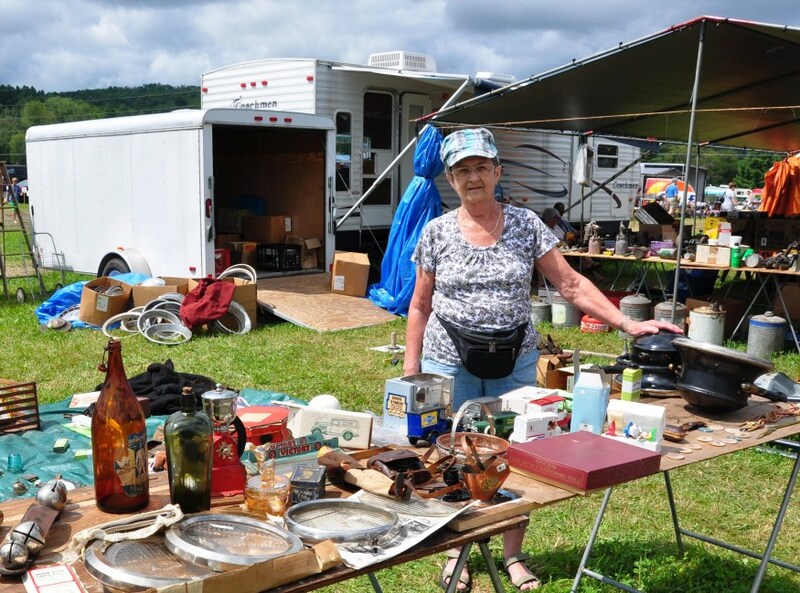 Our next feature vendor is Denise Labrecque from Lyndonville, Vermont. 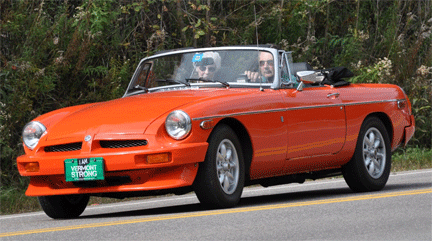 This might be the last Stowe Car Show for Denise unless her son Richard decides to continue. Denise and her husband Rene started coming to our show many years ago and some-times covered 20 others in one summer. Denise lost Rene seven years ago and thinks this might be her last year. She has continued these last seven years by loading her car with only what treasures she can lift and with a little help from her vendor neighbors, she has stayed in business. 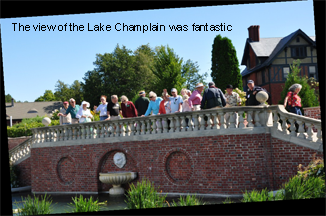 In fact her Stowe Show neighbors have become such good friends over the years they insist that she spend the nights with them. The only comment from them when asked was how great of a lady Denise is. We hope to see you next year Denise….you can’t quit now! 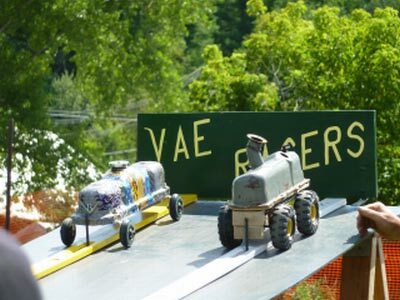 Davey Nadeau has never missed a Stowe Car Show and 2012 was no exception. 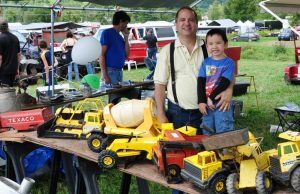 Mr. Nadeau had been there to set up their booth but was not there on Saturday, he had driven home to Surry, NH to tend his two dogs. His son Bryan and grandson Davey II was holding the fort. This was the five-year-old’s second time at the show and he knew the ropes. A customer asked if they had a certain item and dad Bryan didn’t have a chance. Davey II yelled “I’ll get it dad…I’ll get it” and all dad could do was stand and watch. People would walk by the booth and yell to ask Davey how he was doing and he of course would run out to greet them. Dad said he knew everyone around. Davey II was all business until a little blond girl his age walked by with her parents. When she asked if she could have one of the display balloons a new race began, the little blond girl got 100% of his attention. Brian has been helping his dad Davey for many years and says the Stowe Show is one of their best. He said other shows charge much more and very few allow them to stay the night on the grounds. He said they had done very well so far into the weekend. 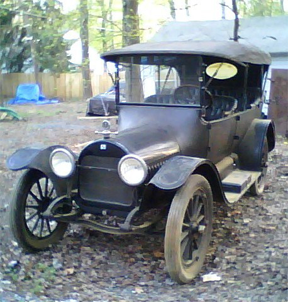 Brian’s business when there are no vendor shows is restoring cars for resale. One last Davey II story…. During the interview dad Bryan started laughing and pointed out one of his son’s ways to start a conversation with strangers. He had just gone up to some passersby and asked if they had seen his father. They of course were ready to help when he points toward Bryan then asked how they were doing. When I called Mervin Wells to ask if I could feature his Hudson Big Boy Pickup for Wheel Tracks this month, all I knew was what is entered in our 2011 Roster. A couple of phone calls later and a visit to Marshfield and presto, I have met some of the nicest folks you can find in all of Vermont. Merv and his wife Clara live in the Winooski River Valley just south of Marshfield in the farmhouse his folks had and where he grew up; a beautiful valley, even in the middle of winter without our normal snow. Merv is 90 years old and they have been married 67 years, he was a plumbing and heating specialist and Clara a bookkeeper at Goddard College for many years. Their daughter Betty claims the reason for her parent’s great health is Clara’s cooking skills, she has a degree in nutrition. Merv was a drummer in a band back in the 40s and even though Clara’s folks wanted her to “stay away from that drummer”, they finally did marry and raised a family of four boys and two girls, which has led to some 33 around the Thanksgiving table with 5 missing. 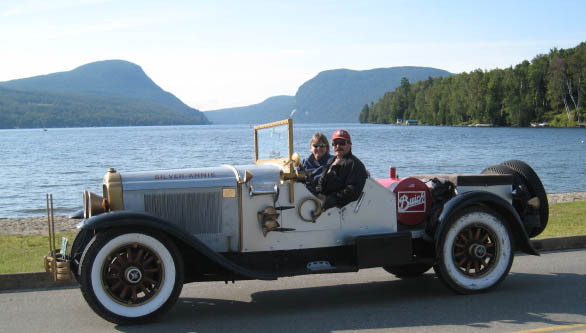 Now to the Hudson… Merv purchased the Big Boy in Florida 27 years ago from Ralph Adell. 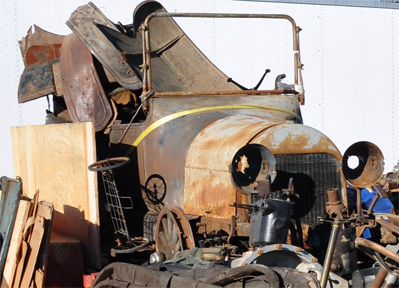 The truck needed a lot of work and restoration but Ralph told Merv he would have no problem driving it home to Vermont and that is what he did, with his son following behind. 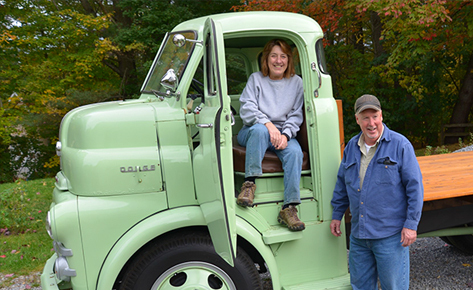 Years earlier Ralph had found the Hudson in a Connecticut woods and needed to clear trees that had grown up around the truck to get it out. 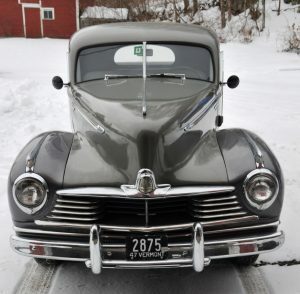 Once the Big Boy was pulled out of the woods Ralph added a battery, gas and oil; started it with no problem and drove it to his home in Pennsylvania, a tribute to 262 flathead 6 cylinder engine. I also heard that engine running and some could say the sound could be close to music. Merv has since painted the truck in the beautiful two tone grey that you see in the picture, reworked the wood and added many new parts including all new tires. 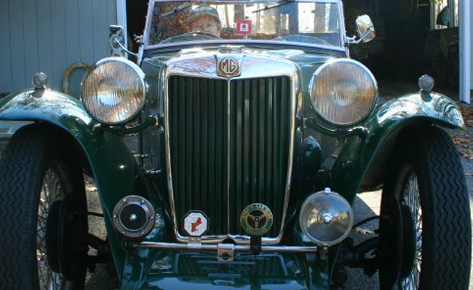 Parades in the area have included Merv and his Big Boy for years but since a small stroke a few years ago has limited his use of the clutch, he has decided to sell. Someone will end up with quite a treasure and the day it leaves that valley, I am sure, will be a sad day. You will see the listing in the classifieds for the contact information. It was a great pleasure to meet you Merv and Clara, I wonder if there is a day in the future when you could attend a club meeting.